Perry County Animal Rescue (PCoAR) was started in 2009 because of love for animals. The core mission of PCoAR is to shelter lost and unwanted animals from Juniata and Perry Counties until a new home is found. PCoAR will promote responsible pet ownership through spay/neuter education, vaccinations and general pet care. With the help of volunteers, PCoAR has successfully found homes for many animals as well as reuniting lost pets with their families. 717-589-3005 Please feel free to leave a message, as we are probably out playing with the animals! Paula says that critters have followed her home all her life and they’ve always been a big part of her life. They have given her so much. She feels that now is the time to try and return the favor. Paula believes she is finally doing what she was always meant to do and the critters are STILL giving her more then she feels able to give back. Each and every animal takes a bit of her heart but gives back tenfold. Paula feels the animals shame her in the way they forgive, forget, and are always ready to love again. They amaze her! Jeff remembers having pets as a kid which he enjoyed. But when he met his wife, Paula, and she said, "Love me, love my kids and love my pets," he had NO idea what he was getting into. Helping unwanted and abandoned pets is something he never knew he would be doing but it has become a very big part of his life. Brandy spent over 20 years in the healthcare industry. She now works in real estate. Brandy has lived most of her life in Perry County. She shares her home with her husband, 7 dogs and foster dogs. She is an avid outdoors woman and enjoys camping, fishing, hunting, kayaking, nascar racing and spending time with friends and family. Laura grew up around animals. She can't imagine her life without a dog or a cat. She currently lives in Newport with her dogs; Ham, Dorothy and Bowie and cats Wyatt, Squishy and Ziggy. She believes she will forever follow in her parents' footsteps, helping homeless pets. Karen graduated from Pace University in NYC in 1979. She lives in Thompsontown with her husband and 3 daughters. Formerly she worked as an estate and trust paralegal in Lancaster and as a trust officer for Merchants Bank in Burlington, VT. Now she is a homeschooling mother who volunteers at the Juniata County Food Pantry and the Perry County Animal Rescue. Joe is a native of Halls, TN. 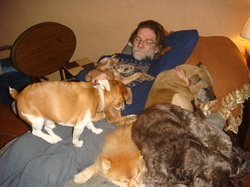 He has always been a dog lover, owning beagles, red bone hounds and mutts on the family farm. After 25 years in the Marine Corps (1967-1992), Joe taught Social Studies at West Perry High School from 1994 to 2011. He is passionate about tobacco pipes, motorcycles, and dog rescue. He has been involved with PCoAR almost since its beginnings. Joe also supports Beagle Rescue of Southern Maryland and Mastiffs to Mutts Rescue in Chambersburg. He has 7 dogs, 6 being rescues.